This document serves as an introduction to using Cilium to enforce memcached-aware security policies. It walks through a single-node Cilium environment running on your machine. It is designed to take 15-30 minutes. NOTE: memcached-aware policy support is still in beta. It is not yet ready for production use. Additionally, the memcached-specific policy language is highly likely to change in a future Cilium version. Memcached is a high performance, distributed memory object caching system. It’s simple yet powerful, and used by dynamic web applications to alleviate database load. Memcached is designed to work efficiently for a very large number of open connections. Thus, clients are encouraged to cache their connections rather than the overhead of reopening TCP connections every time they need to store or retrieve data. Multiple clients can benefit from this distributed cache’s performance benefits. There are two kinds of data sent in the memcache protocol: text lines and unstructured (binary) data. We will demonstrate clients using both types of protocols to communicate with a memcached server. Now that we have Cilium deployed and kube-dns operating correctly we can deploy our demo memcached application. Since our first HTTP-aware Cilium demo was based on Star Wars, we continue with the theme for the memcached demo as well. Ever wonder how the Alliance Fleet manages the changing positions of their ships? The Alliance Fleet uses memcached to store the coordinates of their ships. The Alliance Fleet leverages the memcached-svc service implemented as a memcached server. Each ship in the fleet constantly updates its coordinates and has the ability to get the coordinates of other ships in the Alliance Fleet. In this simple example, the Alliance Fleet uses a memcached server for their starfighters to store their own supergalatic coordinates and get those of other starfighters. A-wing: can set coordinates to key “awing-coord” and get the key coordinates. X-wing: can set coordinates to key “xwing-coord” and get the key coordinates. Alliance-Tracker: can get any coordinates but not set any. memcached-server : A Kubernetes service represented by a single pod running a memcached server (label app=memcd-server). a-wing memcached binary client : A pod representing an A-wing starfighter, which can update its coordinates and read it via the binary memcached protocol (label app=a-wing). x-wing memcached text-based client : A pod representing an X-wing starfighter, which can update its coordinates and read it via the text-based memcached protocol (label app=x-wing). alliance-tracker memcached binary client : A pod representing the Alliance Fleet Tracker, able to read the coordinates of all starfighters (label name=fleet-tracker). Memcached clients access the memcached-server on TCP port 11211 and send memcached protocol messages to it. The file memcd-sw-app.yaml contains a Kubernetes Deployment for each of the pods described above, as well as a Kubernetes Service memcached-server for the Memcached server. We suggest having a main terminal window to execute kubectl commands and two additional terminal windows dedicated to accessing the A-Wing and Alliance-Tracker, which use a python library to communicate to the memcached server using the binary protocol. In your main terminal window, have X-wing starfighter set their coordinates using the text-based protocol to the memcached server. $ kubectl exec $XWING_POD sh -- -c "echo -en \"$SETXC\" | nc memcached-server 11211"
$ kubectl exec $XWING_POD sh -- -c "echo -en \"$GETXC\" | nc memcached-server 11211"
Imagine if a starfighter ship is captured. Should the starfighter be able to set the coordinates of other ships, or get the coordinates of all other ships? Or if the Alliance-Tracker is compromised, can it modify the coordinates of any starfighter ship? If every client has access to the Memcached API on port 11211, all have over-privileged access until further locked down. $ kubectl exec $XWING_POD sh -- -c "echo -en \"$GETAC\" | nc memcached-server 11211"
Thus, the Alliance Fleet Tracking System could be made weak if a single starfighter ship is compromised. 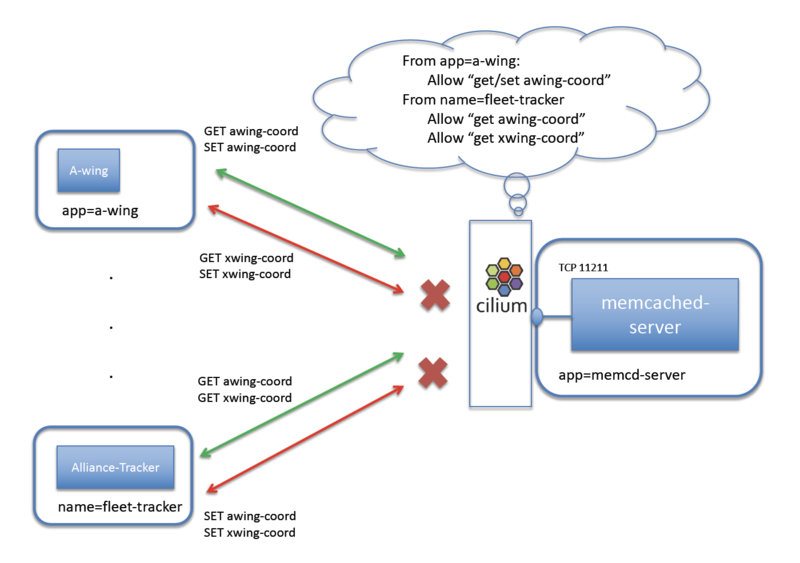 Cilium helps lock down Memcached servers to ensure clients have secure access to it. Beyond just providing access to port 11211, Cilium can enforce specific key value access by understanding both the text-based and the unstructured (binary) memcached protocol. We’ll create a policy that limits the scope of what a starfighter can access and write. Thus, only the intended memcached protocol calls to the memcached-server can be made. In this example, we’ll only allow A-Wing to get and set the key “awing-coord”, only allow X-Wing to get and set key “xwing-coord”, and allow Alliance-Tracker to only get coordinates. A CiliumNetworkPolicy contains a list of rules that define allowed memcached commands, and requests that do not match any rules are denied. The rules explicitly match connections destined to the Memcached Service on TCP 11211. 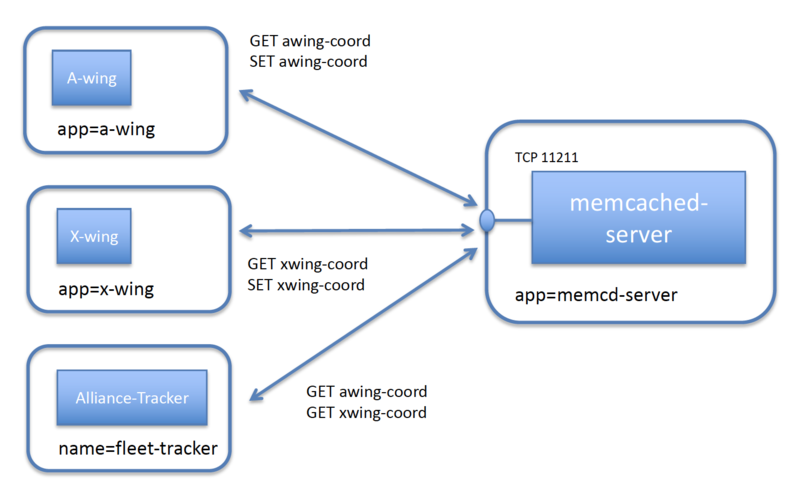 The rules apply to inbound (i.e., “ingress”) connections bound for memcached-server pods (as indicated by app:memcached-server in the “endpointSelector” section). The rules apply differently depending on the client pod: app:a-wing, app:x-wing, or name:fleet-tracker as indicated by the “fromEndpoints” section. With the policy in place, A-wings can only get and set the key “awing-coord”; similarly the X-Wing can only get and set “xwing-coord”. The Alliance Tracker can only get coordinates - not set. The policy is working as expected. With the CiliumNetworkPolicy in place, the allowed Memcached calls are still allowed from the respective pods. $ SETXC="set xwing-coord 0 1200 16\r\n9854.34,926.9187\r\nquit\r\n"